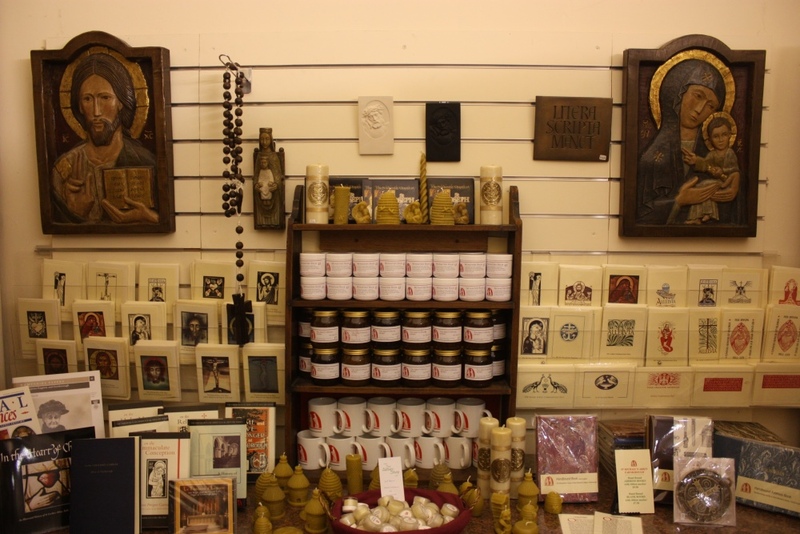 The Abbey Shop is an important part of the income for the Abbey. In addition to the ‘real’ shop near the Abbey entrance, there is also the much busier ‘virtual’ shop on the internet.  In the last months this has been extensively updated, in order to offer more products and to make access to the site easier. Brother Michael turned his cell into a temporary photographic studio to give better images of the products we offer. 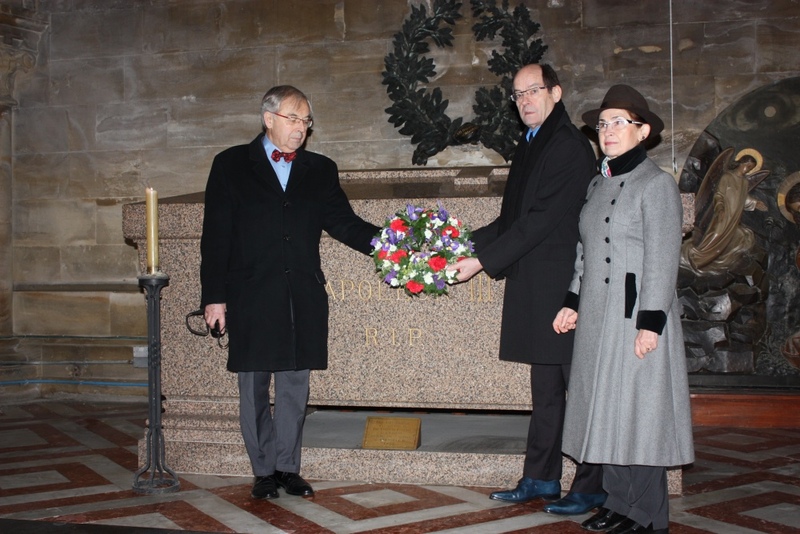 On January 9th, the anniversary of the death of the Emperor Napoleon III, three representatives of the Souvenir Napoleonien came from France to hear Mass and pay their respects at the tomb of the Emperor. After Mass, the monks chanted the Libera and customary prayers for the dead in the crypt. The Christmas music and ceremonies went very well at the Abbey. Christmas is always ‘family time’ for the monks, a very quiet and peaceful time. This year we welcomed our friend Zac Povis (left) from the Pontifical North American College, Rome, to share our celebrations. 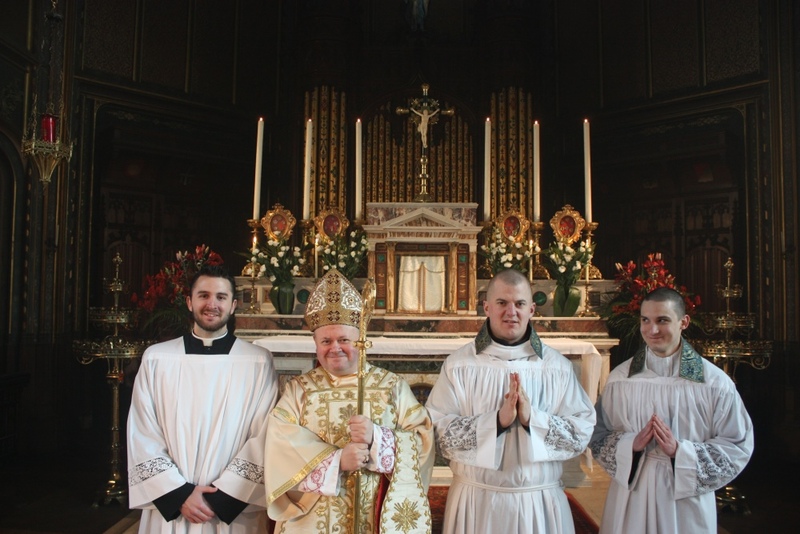 Zac will be ordained deacon in the course of 2014. Mother nature offers her usual splendid array of Autumn colours. We were delighted to be invited to attend the Solemn Monastic Profession of Sr Mary Thomas at St Cecilia’s Abbey Ryde. Although our own abbot invariably attends the greater festivals in the life of the Ryde community he was unable to be present at this one as he was carrying out a Canonical Visitation at the monastery of Thien Tam in Texas, which belongs to our province and congregation. The profession offered the usual Ryde fare of magnificent chant and a festal recreation. 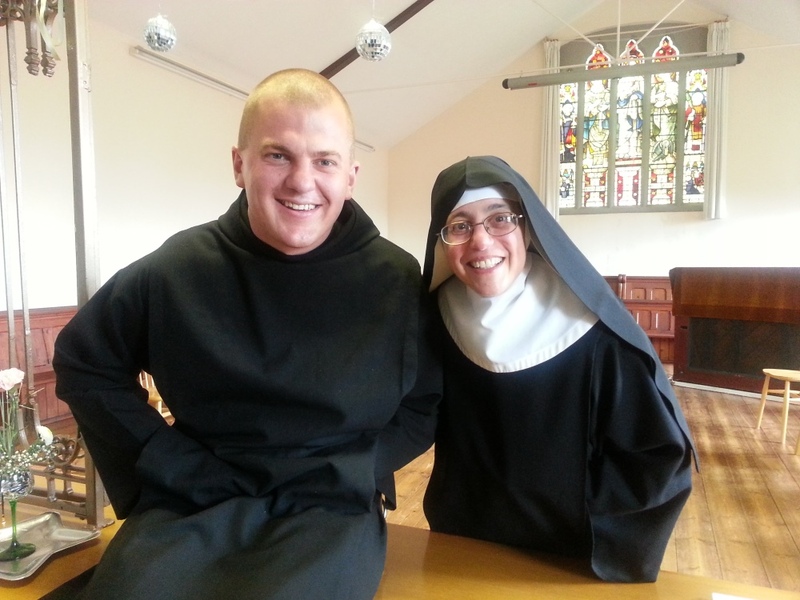 A good time was had by all, and Sr Mary Thomas looks very much the part in her new cowl. 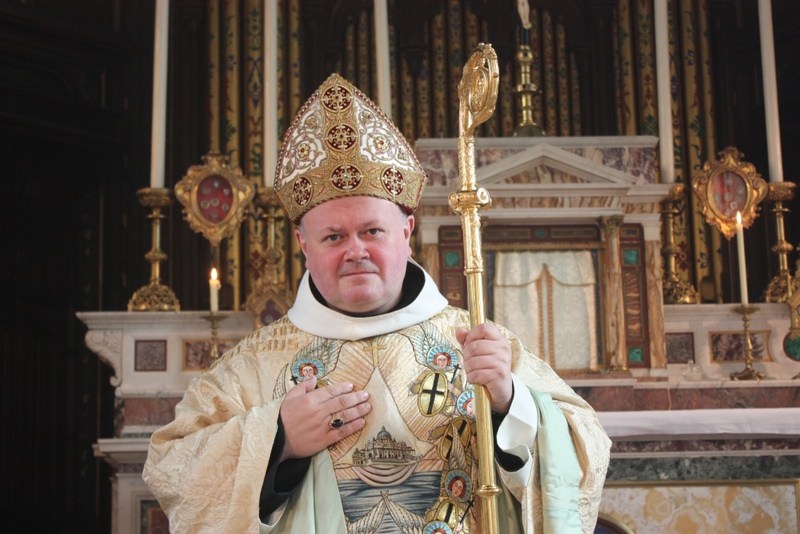 Our Brother Michael is a great friend of the Carmelite nuns at Notting Hill. Although the nuns work very hard in their own grounds, they sometimes call in Brother Michael to help with particularly demanding jobs. 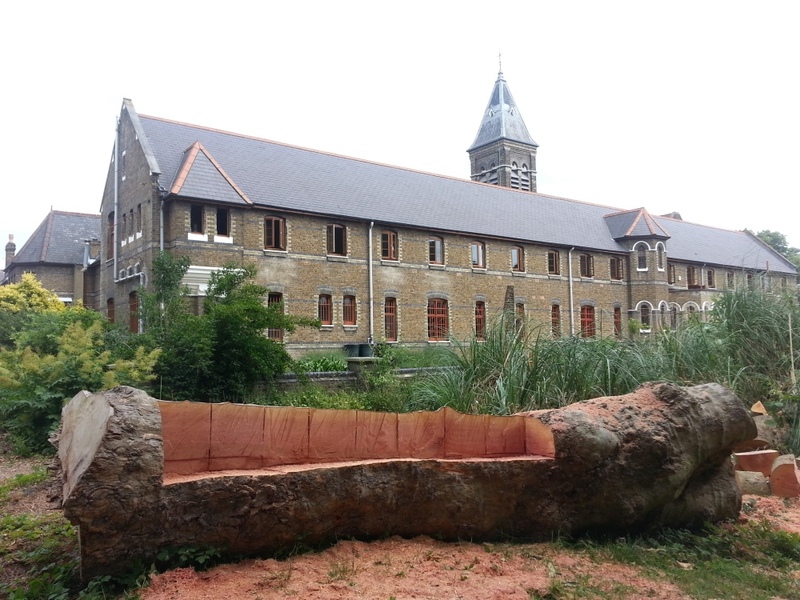 With the high winds of the last year, the nuns have had many trees damaged in their monastery enclosure. 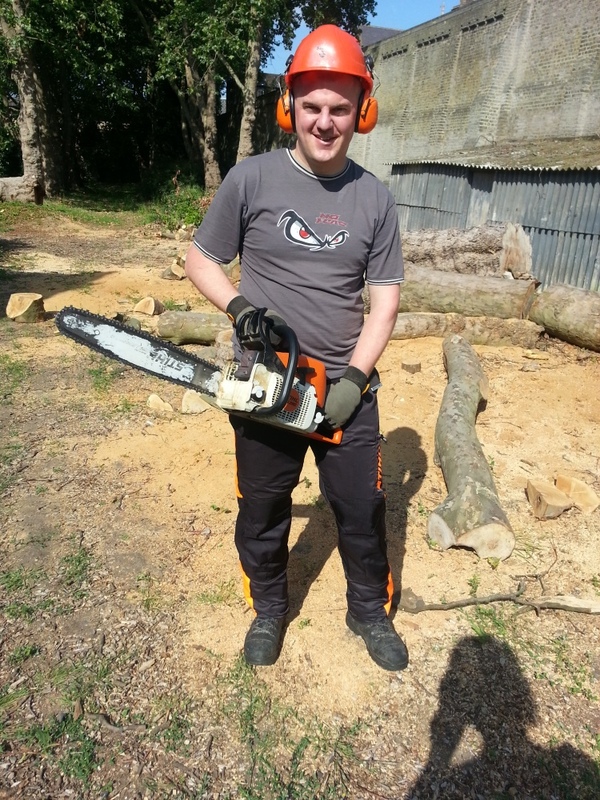 Brother Michael spent a couple of happy days with his chainsaw, making things more manageable for them. The nuns used to sit under this tree. Now they sit on it! 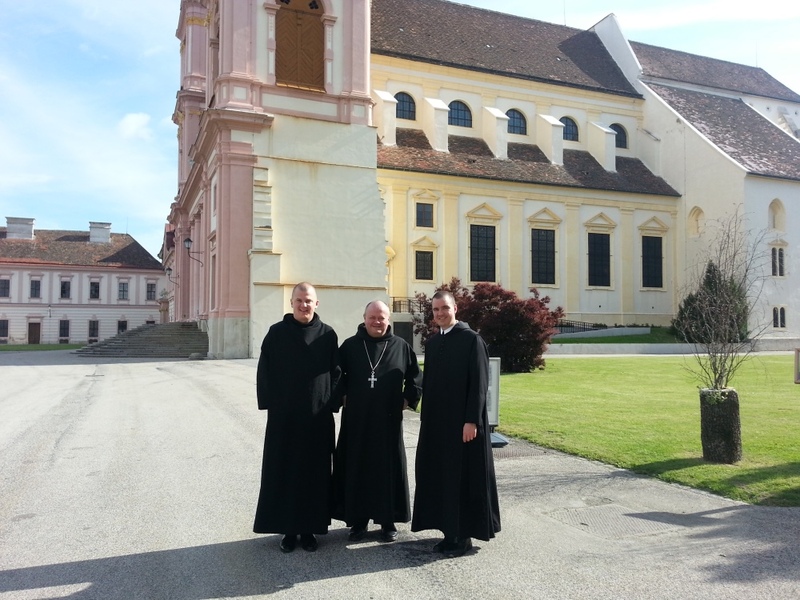 Fr Abbot and Dom Michael were warmly welcomed by Fr Patrick of the Abbey of Göttweig in Austria. Fr Patrick is a South African in an Austrian monastery. His parents live in England and he tries to visit Farnborough on the rare occasions he leaves his cloister. Dom Patrick has recently concluded his studies in Salzburg, and proved an excellent guide to that beautiful city. In recent years we have enjoyed a strong contact with the Slovak Mission in London. This is one of the 60-odd ‘ethnic chaplaincies’ catering for the needs of immigrants in our capital. 2013 was a particularly significant year for them, being a major anniversary of the evangelisation of the Slavs by their ‘apostles’ Saints Cyril and Methodius. The Church in Slovakia keeps the feast in July (it is in February in the Latin Rite generally). In July there was a special celebration for the feast. In the Summer there was a superb play, written and performed by the Slovak Mission on the life of the two saints. Fr Abbot and Dom Michael attended one of the performances. It was in Slovak but with headphones and simultaneous translation for the foreigners. 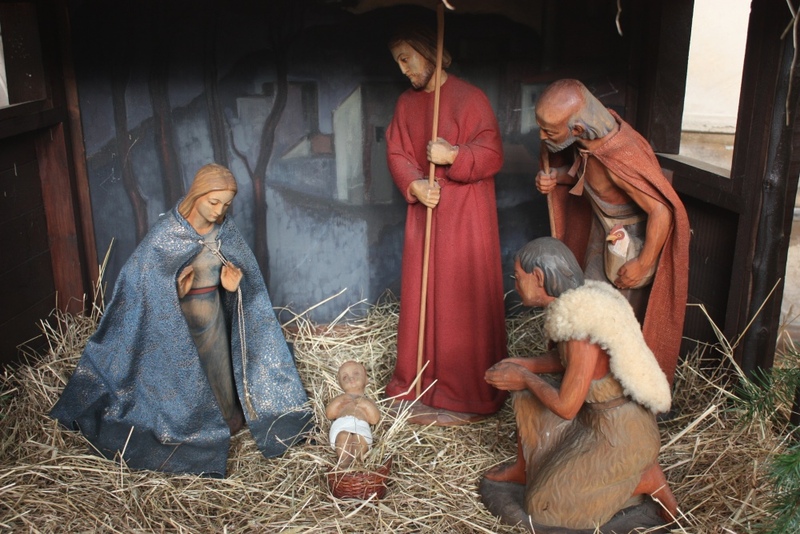 The quality of the production was very high, and the play communicated very efficiently the main problems and successes of the brothers’ bringing of the gospel to the Slavic nations. It is very appropriate that you should have a foreigner to speak to you today on this celebration of St Cyril and St Methodius – those two foreigners who came to bring the good news of Jesus Christ to the Slavic peoples. And also that you invite a Benedictine monk – because St Benedict is the patron of our part of Europe just as Cyril and Methodius are the patrons of yours. A couple of weeks ago I was in some very strange places! Nitra, Bratislava Spisska Capitular and many others. It was my third or fourth visit to Slovakia. Slovakia is an amazing place. It is stunningly beautiful, wonderfully rural and green and the mountains are so magnificent that they take your breath away. If ever I leave the monastery I could work for a Slovak tourist organisation. I would make some great publicity for you! When I visit Slovakia I begin to understand how easy it is for you Slovaks to love your country. It is a country with great character and with a great history and culture. You have so much that we in the west of Europe have lost – your village customs and national dress, your food, and many other things! Then there are all those things that an Englishman will never understand – putting the fish in the bath before Christmas – throwing water over women on Easter Monday, May poles in the gardens of the girls. What strange people you are! Each one of you here has come to England for a different reason. Perhaps work, perhaps study, perhaps family, but you keep in your hearts a bit of Slovakia – you know that your true homeland is under the Tatras mountains and you know that the mountains will always be in your heart and your heart will always be in the mountains. This is how exiles feel. And being far from home can teach us something about God. Because we have another homeland – and that is heaven. We are all exiles from heaven which is our true home – to which we hope to go when we die. And wherever we are on this earth we should always in our hearts a desire a thirst to be with God in heaven. And we should live in simplicity and prayer, and make all our decisions in life with heaven in mind. This thirst for God is what we celebrate today in remembering St Cyril and St Methodius, the Apostoli Slavorum Apostles of the Slavs. These two brothers answered the call of God and the call of the Slavic peoples to come and be their apostles – to preach the gospel to them. They had a very hard time preaching that gospel, not because of the people who were naturally thirsty for the good news of Jesus Christ, but because of politics and governments, because of jealousies within the Church. Bad letters were written about them filled with lies. They suffered greatly for their faith but kept their eyes on Jesus and the gospel and steadily and carefully continued their mission. They preached in the ninth century things which have endured to the 21st – precious treasures which you should be very proud of. The Catholic faith – a profound union with and love for Rome, and most of all the gift of the gospel. We don’t know how much of the bible they translated – Cyril was a great linguist – he knew Arabic and Hebrew as well as Greek. When he was given the job of converting the Slavs he used his language gifts to devise the alphabet so that it could be written down. And so the Slavic nations have a very particular gift– the Slavic languages were written down for one purpose – the preaching of the gospel and the sacred liturgy. Every time you open your mouth to say a word – you must thank Ss Cyril and St Methodius for their work in making your language sacred a language written for the praise of God and the preaching of the gospel. When you are next in Slovakia – keep in mind that the ground there is consecrated – made holy by the footsteps of those two holy brothers all those centuries ago. Make sure you have lots of Euros with their picture – even though some in the European Union have tried to take away the holy cross from it. And be proud of your country and tradition. But you also must remember what a tradition is. A tradition is something handed on down the ages, a link in a chain. The chain has held strong through many troubled times. You are the links today. Keep your hearts in the mountains breathing the best things of your country- faith and family – even while your feet are walking around London! Be strong and be faithful to the gospel, and may St Cyril and St Methodius pray for us all. Je veľmi vhodné, že sa k Vám dnes počas osláv svätých Cyrila a Metoda prihovára cudzinec, lebo aj svätí Cyril a Metod boli cudzincami, ktorí priniesli Sväté Písmo slovanským národom. A tiež je dobré, že ste si pozvali benediktínskeho mnícha, pretože svätý Benedikt je patrónom našej časti Európy tak ako Cyril a Metod sú patrónom tej Vašej časti. Musím sa priznať, že pred niekoľkými týždňami som navštívil pre mňa veľmi zvláštne miesta. Bol som v Nitre, Bratislave, Spišskej Kapitule a v mnohých ďalších mestách. Bola to moja tretia alebo štvrtá návšteva na Slovensku. Slovensko je skutočne úžasná krajina. Je neuveriteľne krásna, s nádherným vidiekom, plná zelene a s takými očarujúcimi horami, ktoré človeku vyrážajú dych. Keby som sa raz rozhodol, že opustím kláštor, spokojne by som sa mohol zamestnať v ktorejkoľvek turistickej kancelárii a robil by som Vám skvelú reklamu. Až keď som navštívil Slovensko, začal som si uvedomovať, aké je pre Vás, Slovákov, ľahké milovať svoju krajinu. Je to rázovitá krajina s bohatými dejinami a kultúrou. Máte mnoho z toho, o čo sme my tu na západe Európy prišli. Máte dedinské zvyky a folklórne kroje, dobré jedlo a mnoho ďalšieho. A potom máte ešte kopec iných vecí, ktoré Angličania nikdy nepochopia, ako napríklad, dávanie kapra do vane na Vianoce, olievanie dievčat na Veľkonočný pondelok a stavanie májov. Nuž, Slováci, poviem Vám, ste vy ale čudný národ! Každý z Vás prišiel do Anglicka z rôznych dôvodov. Možno ste tu kvôli práci, štúdiu, možno kvôli rodine, ale vo Vašich srdciach si stále nesiete kúsok Slovenska. Viete, že Váš pravý domov je pod Tatrami a tiež si uvedomujete, že hory budú mať vždy vo Vašich srdciach výnimočné miesto a že v nich vždy Vaše srdcia spočinú. A presne také isté pocity prežívajú aj vyhnanci. Na druhej strane byť vzdialený ďaleko od domova nás môže naučiť veľa o Bohu. My všetci máme totiž ešte jeden domov, a to ten nebeský! Všetci sme boli akoby vyhnaní z neba, ktoré je naším skutočným domovom a do ktorého sa raz po skončení pozemského života s nádejou túžime vrátiť. A preto kdekoľvek by sme boli tu na zemi, mali by sme si stále zachovávať v našich srdciach silnú túžbu, neuhasiteľný smäd byť s Bohom v nebi. Mali by sme žiť v jednoduchosti a v modlitbe a pri robení našich pozemských rozhodnutí vždy mať nebo na pamäti. Tento smäd po Bohu je presne tým, čo dnes slávime pri spomienke na svätých Cyrila a Metoda, Apostoli Slavorum, apoštolov Slovanov. Títo dvaja bratia odpovedali na volanie Boha a na volanie Slovanov, aby prišli na ich územie, stali sa ich apoštolmi a hlásili evanjelium. Hlásať evanjelium pre nich nebolo vôbec ľahké, a nie kvôli ľuďom, ktorí boli prirodzene smädní po Kristovi, ale práve kvôli vtedajšej politike a vládam a tiež kvôli rôznym škriepkam a závisti v cirkvi. Písali sa o nich listy plné lží. Pre svoju vieru veľa trpeli, ale to im nezabránilo, aby vždy upierali svoj zrak na Pána Ježiša a na sväté písmo a aby naďalej pevne a vytrvalo pokračovali vo svojej misii. Už v deviatom storočí hlásali hodnoty, ktoré pretrvali až do 21. storočia. Hovorili o vzácnom poklade, na ktorý by ste mali byť aj patrične veľmi hrdí. Hovorili o katolíckej viere ako o hlbokom spojení s Bohom, o láske k Rímu, ale predovšetkým o dare evanjelia. Nevieme presne, akú veľkú časť biblie preložili. Ale vieme, že Cyril bol vynikajúci lingvista. Ovládal arabčinu a hebrejčinu a rovnako aj gréčtinu. Keď bol poverený, aby šiel evanjelizovať Slovanov, využil svoje jazykové schopnosti, aby zostavil abecedu, čím slovanské jazyky dostali písomnú podobu. Slovanské národy dostali veľmi vzácny dar. Ich jazyky boli spísané za jediným účelom, a teda na hlásanie evanjelia. A preto vždy keď sa nadýchnete a budete sa chystať prehovoriť, ďakujte vo svojom vnútri svätým Cyrilovi a Metodovi za ich prácu, že posvätili Váš jazyk a spísali ho preto, aby sa ním velebil Boh a hlásalo evanjelium. Keď pôjdete nabudúce na Slovensko, spomeňte si, že kráčate po požehnanej zemi. Požehnanej, lebo pred storočiami po nej kráčali títo dvaja svätí bratia. Pousilujte sa, aby ste mali aj veľa eur s ich vyobrazením, aj napriek tomu, že niektorí z Európskej únie sa pokúsili z mince odobrať znak svätého kríža. A buďte hrdí na svoju krajinu a tradície. Zároveň však vedzte, čo tradícia znamená. Tradícia je pokladom, ktorý sa predáva z generácie na generáciu. Je akýmsi článkom na reťazi, pritom reťaz musí byť veľmi pevná, aby sa nepretrhla v ťažkých časoch. A vy ste dnes týmito spojivkami na reťazi. Nech Vaše srdcia naďalej zostávajú v horách a nech dýchajú len tým najlepším, čo Vám Vaša krajina dala. Hodnotami, akými sú pre Vás viera a rodina, aj keď práve kráčate niekde po uliciach Londýna. Buďte silní a verní evanjeliu. A nech za nás všetkých orodujú svätí Cyril a Metod. 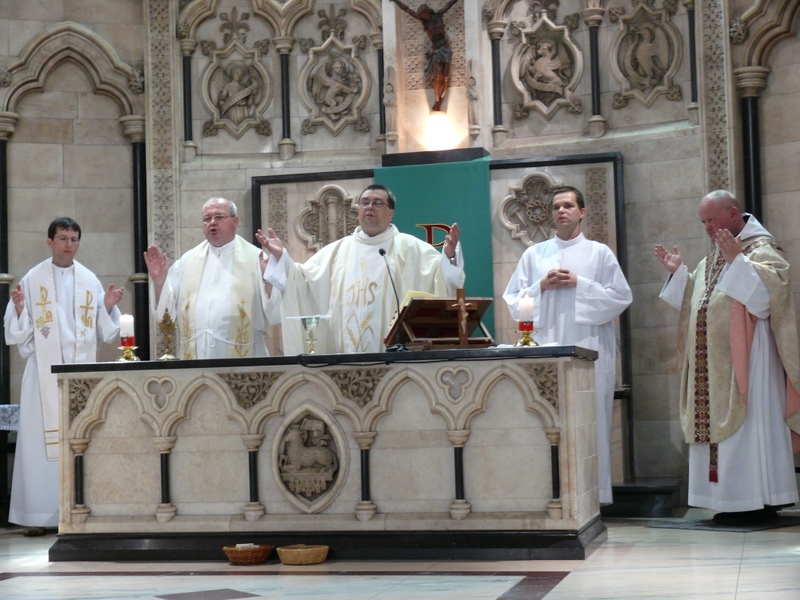 The community celebrated its patronal feast with the usual splendour in church and refectory. The ‘St Michael’ vestments were given their annual airing. They show, in exquisite embroidery, the barque of Peter on the front and St Michael vanquishing the devil on the reverse. In September, the Prioress and Novice Mistress, Sr Mary David Totah, celebrated her Silver Jubilee of Monastic Profession. 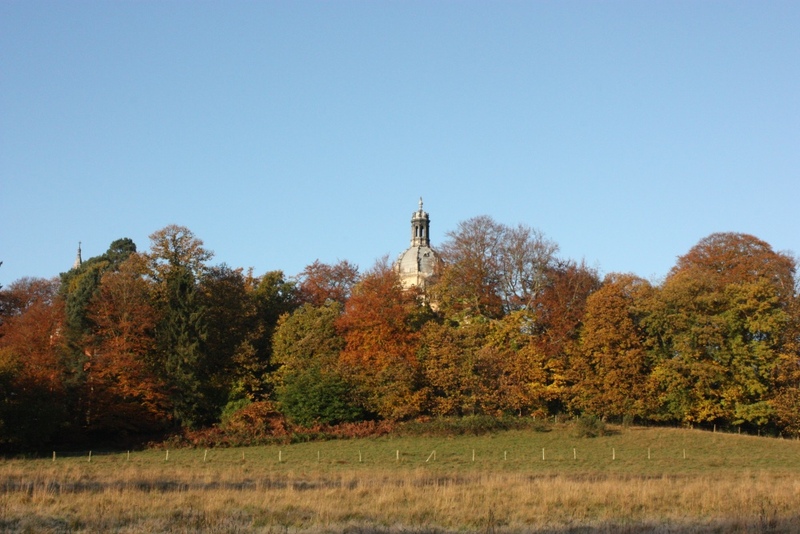 An American by birth, Sr Mary David discovered Ryde during her Oxford years. She is from a family of Palestinian Christians, and the celebration of the Jubilee was delayed by several months in order to allow her parents and sister from the United States, and family members from the Middle East, to be present at the celebrations. 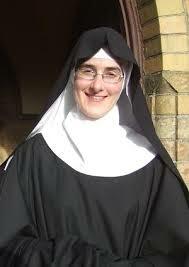 Our Abbot and Sister Mary David are old and close friends. Fr Abbot presided and preached at the Jubilee Mass during which Sr Mary David renewed her vows.